Background Patients at times disagree with medical recommendations for religious reasons. Despite a lively debate about how physicians should respond to patients’ religious concerns, little is known about how physicians actually respond. We explored the ways in which physicians interpret and respond to conflict between medical recommendations and patients’ religious commitments. Methods One-to-one, in-depth, semistructured interviews with 21 physicians from a range of religious affiliations, specialties, and practice settings. Interviews were transcribed, coded, and analyzed for emergent themes through an iterative process of textual analysis informed by the principle of constant comparison. Results Conflict introduced by religion is common and occurs in 3 types of settings: (1) those in which religious doctrines directly conflict with medical recommendations, (2) those that involve an area in which there is extensive controversy within the broader society, and (3) settings of relative medical uncertainty in which patients “choose faith over medicine.” In response to such conflict, physicians first seek to accommodate patients’ ideas by remaining open-minded and flexible in their approach. However, if they believe patients’ religiously informed decisions will cause them to suffer harm, physicians make efforts to persuade patients to follow medical recommendations. Conclusions When religiously related conflict arises, physicians appear to intuitively navigate a tension between respecting patients’ autonomy by remaining open-minded and flexible and seeking patients’ good by persuading them to follow medical recommendations. In such contexts, religion and medicine are intertwined, and moral counsel inheres in physicians’ medical recommendations. Many patients understand, cope with, and navigate their experience of illness through explicit reference to their religious beliefs and values.1-3 At times, patients’ religious ideas will conflict with physicians’ recommendations. How physicians should respond to such disagreements has been the subject of some discussion, but little is known about how physicians actually navigate such conflicts. This study explores physicians’ interpretations of and responses to religiously related conflict in the medical encounter. Interviews were conducted by 2 investigators (F.A.C. and C.J.R. ), and followed an interview guide centered on open-ended “grand tour” questions designed to “elicit narratives detailing the informant’s conception of the identified domains.”5 Specifically, we asked physicians to describe their understanding of any relationship between religion and spirituality and health, how they approach religious and spiritual issues with patients, and how they understand their own religious or other worldviews to shape their practice of medicine. Follow-up probes and questions clarified and explored physicians’ ideas further. We constructed and revised the interview guide based on insights from pilot interviews and review by expert colleagues. Interviews were tape-recorded and transcribed verbatim. We analyzed transcripts by employing an iterative process of textual analysis informed by the principle of constant comparison.6 After the first and sixth interviews, 2 of us (F.A.C. and C.J.R.) independently coded the full transcripts by identifying and labeling discrete units of text that referred to 1 or more concepts relevant to the study purpose. They met together subsequently to develop consensus and to create a working codebook of categories, subcategories, and concepts. Using qualitative analysis software (ATLAS.ti, version 4.2; Scientific Software Development, Berlin, Germany), we then coded all prior and subsequent transcripts according to the codebook formulations. At various points throughout the study, an inductive approach to the data was employed to identify emergent themes and to identify relationships and patterns between the themes. Finally, representative quotations were chosen to demonstrate the themes we identified. To ensure the trustworthiness of our findings, we employed credibility checks commonly used in qualitative research. To honor the principle of reflexivity,7 before data collection 2 of us (F.A.C. and C.J.R.) independently wrote extensive responses to the interview questions and together wrote summaries of the personal dimensions that each brought to the research table. After data analysis, an experienced qualitative analyst (R.G.-B. ), with knowledge of the reflexivity summaries, systematically reviewed and coded a portion of the transcripts to assess the consistency and fidelity of the analysis and to look for competing conclusions. The process of bringing to bear multiple perspectives in data collection, analysis, and interpretation strengthens the credibility of the analysis and is known as investigator triangulation. Finally, we conducted interviews until we reached theme saturation, a point after which subsequent interviews produced no substantial new themes. The University of Chicago Institutional Review Board approved this study. Almost all of the physicians who participated in our study described situations in which patients use religious terms to explain their disagreement with medical recommendations. Such disagreements appear to fall into 1 of 3 overlapping domains, which are discussed herein. We have a lot of Jehovah’s Witnesses and . . . you know, the thing with blood transfusions and all that comes up all the time. I feel like as long as somebody understands the situation, then that’s his or her choice. I think that’s OK [interview 7]. I’m upset with [the patient’s] family because I don’t think they realize how hard it is for her to continue this pregnancy every day knowing the baby is going to die. [The usual risks of pregnancy] are worthwhile if you’re going to have a healthy baby. But to carry a fetus that has zero chance of living? . . . To me it’s concerning that that doesn’t play into their decision making. There were a lot of Hasidic Jews and . . . my understanding of their value system was that life in any form was better than death. . . . That was an area where my values differed greatly from those values, but the values were tied into faith, I think, and a belief system. . . . It was very frustrating [interview 9]. As in these examples, disagreements often centered on conflicts between religious notions about the sacredness of life and physicians’ judgments that treatment was medically futile. One physician described a patient who refused to schedule a diagnostic colonoscopy despite hundreds of polyps found on screening because she and her daughter believed in the power of prayer. Another [interview 16] described patients who refuse or delay medically indicated therapy because “It’s in God’s hands,” or who say “I know God will provide—I don’t need that test.” These conflicts appeared to be less about the facts of a particular clinical situation (eg, the patient previously described did not deny that she had polyps) than about the meaning of the clinical facts and their implications for further action. Another physician [interview 2] noted, “I think [the patients] trust God more than they trust us. . . . 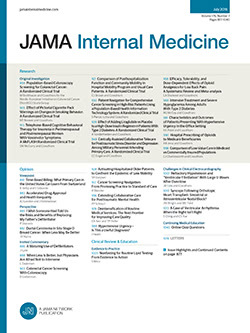 They have a faith in God, and they don’t have a faith in us.” In general, it appears that patients most often decline medical recommendations for religious reasons in settings of relative medical uncertainty in which treatment modalities offer modest probabilities of benefit, or in settings in which medical recommendations are intended to decrease risks of adverse future events. In contrast, physicians did not describe conflict in areas in which medicine offers more certain or more immediate benefit, such as the treatment of acute pain, trauma, or bacterial infections. Physicians expressed ambivalence toward situations in which patients decline medical recommendations for religious reasons. On the one hand, they experience frustration when patients refuse therapy that the physicians are convinced will be of benefit, particularly when tragic results may ensue. When I [interview 2] see someone not wanting to be accepting of treatment that I think they really need—for instance, a woman comes in with a pea-sized nodule that’s found to be breast cancer, and she declines treatment because she wants to pray on it. That’s really tragic for me because I think, “Oh gosh. We can do something for you now, but 6 months from now, it may be a lot harder for us to do something for you. I used to think that my job was to convince them, and I really have completely changed in that respect. . . . I am much more comfortable with the idea of people determining their own destiny and making their own mistakes . . . even when someone makes a decision I think is really foolish—and I watch that a lot [interview 16]. There have been frequent conflicts . . . and how I deal with it is I always find out what the [religious] request is and in what belief system it originates, and I accommodate it—provided that I’m not doing any overt harm that I know [interview 14]. Yet, as the last quotation implies, it appears that physicians’ commitments to “not doing any overt harm” create a threshold. It seems that physicians’ fundamental shared commitment is to promote and protect the patients’ health using their best judgment. If patients’ religious commitments do not substantially conflict with that commitment, they are accommodated without apparent controversy. But if, in the physician’s judgment, a religious patient will suffer harm by not following medical recommendations, the physician’s commitment to preserving the patient’s health may lead the physician to attempt to persuade the patient to reconsider his or her decision. I have said to [my patient] all along that I’m supportive. If she believes prayer will help her, I want to support her in that, but I also don’t want her to die of cancer, so let me repeat the colonoscopy and we can see together [interview 15]. Third, if negotiation within the patient’s paradigm does not persuade the patient, physicians may appeal to members of patients’ religious communities, such as family members or clergy, to clarify whether patients’ decisions are consistent with their religious traditions. In the case of an impasse, several physicians said that they would refer the patient to another provider to diffuse the conflict. I have a lot of issues with the Catholic Church. . . . I am very opposed to their stance on research and termination and birth control issues [interview 3]. [The patient and her daughter] thought they could pray and that this would go away. I implied that I also believe in prayer but . . . that sometimes God answers prayers in different ways and perhaps that’s why she was sent for her procedure in the first place. No, I never have because I wouldn’t have a conflict. Someone else might have a conflict with me, but I’ve never made an issue of my own religion in any other way other than to help and support another person. I would certainly never do anything but support their own beliefs, even if I disagree with them. Only if I see that their beliefs are leading them to be unhappier—If that’s my belief, I will attempt to examine that with them if I think that’s a real problem. One woman who was having trouble with her child—her [religious] view of the situation was so skewed and so inappropriate that there was a lot of work to do there. So, I just planted ideas into her head. I tried to help her come up with a different vision of what was really going on and what its causes were, because she was so off base. In fact, many of the physicians who said that they are careful not to bring their religious values into clinical encounters described efforts in other instances to persuade patients of the inadequacy of the patients’ religious reasoning, particularly when they believed that harm might result from patients’ decisions. These recommendations may seem reasonable and appropriate to many, but they obscure a facet of physicians’ clinical practice that is highlighted in our data. There is no bright line that can be drawn between discussion of medicine and discussion of religion. Therefore, when conflict occurs, moral (ie, religious) counsel inheres in medical recommendations. Science tells patients what they can do, but physicians also tell patients what they should do, and the latter is always a moral exercise. If religious advocacy is a threat to patient autonomy, one must ask whether autonomy is not equally threatened by challenges to patients’ ideas of religious faithfulness, whether or not they conflict with medical evidence. Qualitative methods are powerful for generating rich descriptions of the ways in which physicians think about this complex topic. Yet, as with most in-depth qualitative studies, the sample was small and was chosen for theoretical reasons. As such, we cannot use any statistical inference to predict how the themes we found are distributed within the broader population of physicians. It is conceivable that somewhat different themes would emerge in a different sample. Finally, the analysis and interpretations are those of the authors, and different investigators might have come to somewhat different interpretations of the same data. Future studies are warranted to see if these findings are corroborated by other investigators in other settings. Notwithstanding its limitations, this study provides useful insights into how physicians interpret and respond to religiously related conflict in the clinical encounter. We anticipate that these findings will spur critical reflection on how physicians should respond when such conflict arises. Correspondence: Farr A. Curlin, MD, The University of Chicago Hospitals, Mail Code 2007, 5841 S Maryland Ave, Chicago, IL 60637 (fcurlin@medicine.bsd.uchicago.edu). Accepted for Publication: September 16, 2004. Funding/Support: This study was funded by grant support for “The Integration of Religion and Spirituality in Patient Care Among US Physicians: A Three-Part Study” from The Greenwall Foundation, New York, NY, and from The Robert Wood Johnson Clinical Scholars Program, Princeton, NJ (Drs Curlin, Lantos, and Chin). Acknowledgment: We thank Daniel Hall for his help in ordering and framing the content of the manuscript.